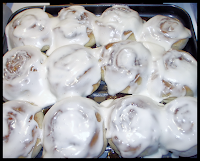 I thought I'd share a picture of the cinnamon rolls I made on Saturday night. And link to the RECIPE that I used. I did not follow the recipe exactly. First of all, instead of butter, I used I Can't Believe It's Not Butter Cooking and Baking Sticks. I have found that this blend tends to add a bit more of a salty taste than margarine so, while I left the salt content the same in the bread part of the recipe, I did not add a pinch to the filling, as it called for. I did the first rising of the dough. I did not let the unbaked refrigerate overnight. Nor did I let the unbaked rolls rise again before baking. I baked these in my counter top convection oven. Also, I added a bit more of everything that the icing called for, so I would have extra. I have to say, even with all the changes I made, these still came out great. Probably the best recipe that I have found so far for cinnamon rolls. I have always wound up with ones that were either like bread with not enough cinnamon flavor, or little dinky cinnamon bricks, the list goes on and on. But, as I said, my luck changed with this recipe and everyone loved them.